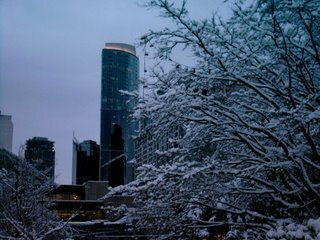 Vancouver Pics . . . .
end early tomorrow morning so I thought sharing some pictures with you would be appropriate . . . . 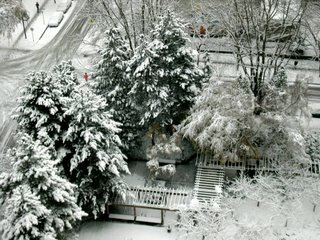 Through a lot of rain, mudslides into the water reservoirs forcing a "boil water" situation, snow falling on a normally snow-free city and then turning frigid with ice-covered streets and sidewalks, I pretty much fully experienced a Vancouver winter. Yeah, I know it's not winter 'til December 22nd, but try and tell these folks that . . . . .
Hope you enjoyed the snowpics . . . .
Next post from warm (75 degrees F) and sunny Florida . . . . 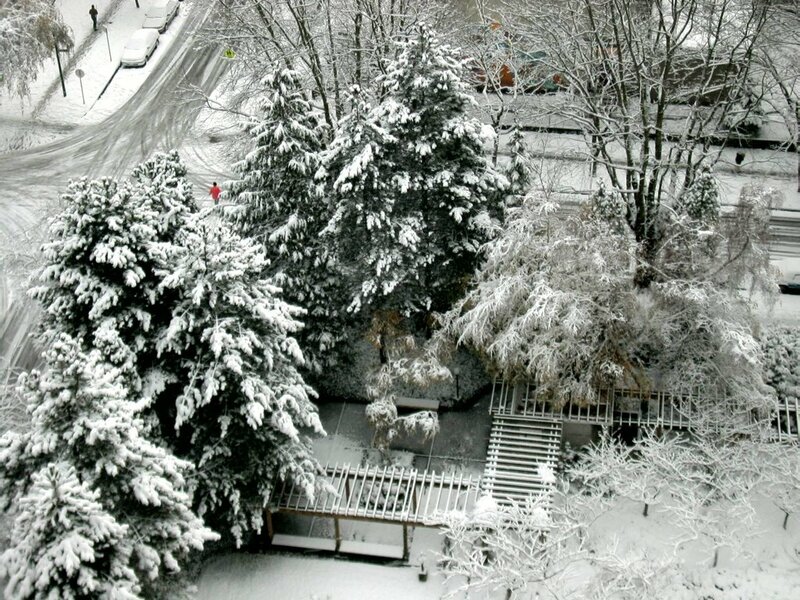 Funny thing, it's still hard to leave Vancouver even with the current weather . . . . Think that legitimizes our decision to move here permanently. News from Two Moms . . . .
Great news from our friends Two Moms to Canada today!! They've been very frustrated with the lack of news from CIC and today they got some . . . . Saw It II . . . .
One more tidbit about the Dixie Chicks "Shut Up and Sing" and then I'll shut up. So not only am I glad to be an Aspiring Canadian, I'm especially glad to be an Aspiring Vancouverite who contributed to the numbers at this theatre . . . .
Harper outlined the motion in a passionate speech to MPs following question period, leaving the Bloc Quebecois outraged because it planned to ask the Commons Thursday to recognize the predominately French-speaking province as a “nation” with no conditions attached. The prime minister’s intervention in the decades-old dispute has effectively let the Liberal party off the hook for its own divisive plan to address a similar resolution at its policy and leadership convention next week in Montreal. But it also allowed Harper’s Conservatives — some of whom were inclined to vote with the Bloc motion — to cast themselves as the defenders of Canadian unity. It would be interesting to get your thoughts on this move . . . . Are we generally in favor of the motion? Is it merely a political move? Will it's passage - as looks likely - make any difference? What are the long-term ramifications? I must admit not having a strong opinion about this matter, so any enlightenment would be appreciated . . . . Accountability . . . . This article from the November 22nd edition of the Vancouver Sun is an excellent analysis of the those who should be held accountable for their actions in Iraq. Wonder if they will be?? As the American adventure in Iraq rolls through Week 192, the daily roll call for the slain ratchets up from 39 per day in October to 65 per day in November. Fatalities among U.S. troops now average just over two per day, not much by comparison to the wars of attrition that characterized the last century’s mass carnage, but surely ulcerous for a cocksure superpower that was out to unilaterally refashion the world order in the 21st. And having set the bloody juggernaut in motion, nobody knows how to stop it, regardless of the fact that nobody knows where it’s going or whom it will run over next. Which explains why so many war enthusiasts now appear to be scurrying down the hawsers at various ships of state. Then-prime minister Jean Chretien’s decision to resist the jingoistic pressures of the day looks increasing ly prescient. Iraq is a disaster, British Prime Minister Tony Blair appeared to say in an interview on Al Jazeera’s new British channel, although he was backpedalling furiously after the headlines erupted the next morning. Still, he admitted the place is such a mess that United Kingdom citizens should expect to be involved there for generations. Generations — a sobering admission from the man who oozed such assurance when he stood shoulderto-shoulder with U.S. President George W. Bush during the heady “bring it on” days of whipping up public enthusiasm for an invasion. It was supposed to be a cakewalk. Instead, military victory for the U.S. is no longer possible in Iraq, Henry Kissinger is quoted as saying in an Associated Press report from London. If anyone should know whereof he speaks it’s Kissinger, who learned his painful lessons from Vietnam. Kissinger agrees that for the Americans and the British to simply pull their troops out overnight would result in an even greater geo-political catastrophe, destabilizing the entire region upon which the West depends for its strategic oil supplies. The guy who invented shuttle diplomacy actually has a not-so-novel proposal — the U.S. has to start talking with Iraq’s neighbours if order is to emerge from chaos. That would include Iran, Bush’s most recent bogeyman; Syria, whose Baathists spawned Saddam Hussein in the first place, and Turkey. Of course, that conversation might prove difficult with Bush reported in the Israeli newspaper Ha’aretz as telling French President Jacques Chirac that he’d “understand” if Israel launched a pre-emptive military strike against Iran’s nuclear energy program, even though Agence France Presse says in another report that investigative reporter Seymour Hersh has obtained a Central Intelligence Agency assessment which finds no conclusive evidence of any secret Iranian nuclear weapons program beyond what’s been reported to the International Atomic Energy Agency. Frankly, it’s time the people of the U.S. and Britain started seeking some accountability from Bush, Blair and the senior bureaucrats who helped concoct the fictions that have now resulted in 50,000 deaths — give or take a few thousand — of non-combatants, many of them women and children. That estimate is the conservative one, by the way. Some researchers think the dead could number two or three times that total. It’s important to remember that each one of those victims is a person like your wife, husband, son or daughter, grandfather or grandmother. If, as it increasingly appears, the blood of all these innocents was shed in a misguided ideologically-driven experiment by a gang of incompetent policy wonks, there should be demands for accountability — if not in courts of law, then in the court of public opinion. They are the ones who engineered consent for and then launched a war based on false claims that Iraq had weapons of mass destruction which could be deployed in 45 minutes against London and that there were links between Saddam Hussein and Osama bin Laden’s terrorist network. If justice prevailed, the architects who precipitated this carnage in Iraq would be required to account for their misjudgments. Simply allowing them to say “Oops we made a mistake, let’s move on” while the corpses continue to pile up should satisfy no one and should earn the censure of anybody who cares about simple justice for his or her fellow human beings. A Study in Contrasts . . . .
CHICAGO, Illinois (CNN) -- Sen. Barack Obama called Monday for U.S. troops to start leaving Iraq in 2007, arguing that the threat of an American pullout is the best leverage Washington has left in the conflict. "The time for waiting in Iraq is over. It is time to change our policy," said Obama, a freshman Democrat from Illinois touted as a possible national candidate in 2008. "It is time to give Iraqis their country back, and it is time to refocus America's efforts on the wider struggle yet to be won." WASHINGTON (AP) -- Without additional troops to ensure victory in Iraq, the U.S. could be more vulnerable to terrorist attacks at home, Republican Sen. John McCain said Sunday. McCain, a front-running GOP presidential hopeful for 2008, said the U.S. must send an overwhelming number of troops to stabilize Iraq or face more attacks -- in the region and possibly on American soil. "I believe the consequences of failure are catastrophic," said McCain, R-Arizona. "It will spread to the region. You will see Iran more emboldened. Eventually, you could see Iran pose a greater threat to the state of Israel." Looks like the repugs still just don't get it . . . . . This Would Be Just Too Perfect . . . . Thanks to the folks at Crooks and Liars blog, here is a bit of good news regarding the right-wing media pundits . . . . It sure will be refreshing if we finally have some oversight in Congress on issues that affect all of us. "Go, Pat Leahy!!" "Fair and Balanced" - Yeah, right . . . .
Fox News slanting their reports is pretty obvious to most intelligent people and now there's proof . . . . Let's hope mr. murdoch and company continue their downward ratings slide. Saw It . . .
OK, OK, I've blogged about them before but today I got to see the Dixie Chick's documentary "Shut Up and Sing" here in Vancouver. All I can say is see it, and see it on the big screen if you can. It is excellent! One of the best parts about the film was how Canadian audiences stood by the Chicks through all of the controversy. Makes me proud to be an Aspiring Canadian . . . . It's Only a Number, Right? Craig Oliver, host of CTV's Question Period, had Monte Solberg the current Minister of Citizenship and Immigration as one of his guests on yesterday's program. The main topic of discussion was dual citizenship and it's effect on Canada. This topic came to the fore during the Israel/Lebanon confrontation and resulting evacuation of numerous dual citizens earlier this year. Basically, Minister Solberg stated it was something the government was "going to look at and solicit views of" during the next year. In response to questions about undocumented workers in the Toronto area he stated that there are "over 800,000 legal immigration applicants" at the present time and those people deserve to be processed expeditiously. Makes you wonder where you are in that number, doesn't it? Elton tells pope: "Don't Shoot Me, I'm the Piano Player"
You Go, Boy . . . . Organized religion fuels anti-gay discrimination and should be eliminated, pop star Elton John said in an interview published Saturday. "I think religion has always tried to turn hatred toward gay people," the musician, who is openly gay, said in the Observer newspaper's Music Monthly magazine. "Religion promotes the hatred and spite against gays." 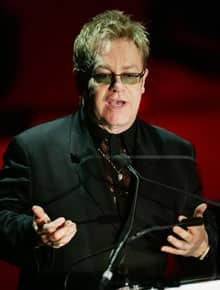 Elton John is critical of organized religion. John made the comments in an interview with Jake Shears, the openly gay frontman for the U.S. dance-rock group Scissor Sisters. Conducted in August from John's home in the south of France, the interview appears in a gay-themed issue of Music Monthly. "There are so many people I know who are gay and love their religion," John said. "From my point of view, I would ban religion completely. Organized religion doesn't seem to work. It turns people into really hateful lemmings and it's not really compassionate." Amen, Elton . . . . Disappointing News . . . . Damn! The one guy that actually has convictions and is right on the issues bows out of the '08 US presidential race. Dems will have a tough time getting anyone with a better track record on standing up for our rights . . . .
Sen. Russell Feingold, an antiwar Democrat from Wisconsin and a longshot contender for president in 2008, announced that he will not seek the Democratic nomination for president. "I'm sure a campaign for president would have been a great adventure and helpful in advancing a progressive agenda. At this time, however, I believe I can best advance that progressive agenda as a senator with significant seniority in the new Senate serving on the Foreign Relations, Intelligence, Judiciary and Budget committees," Feingold said in a letter posted on his Senate campaign Web site today. He said he could not "muster the same enthusiasm for a race for president while . . . trying simultaneously to advance our agenda in the Senate. In other words, if I really wanted to run for President, regardless of the odds or other possible candidates, I would do so. However, to put my family and all of my friends and supporters through such a process without having a very strong desire to run, seems inappropriate to me." As he campaigned in 17 states for other Democrats, Feigngold said, people "responded well" to his opposition to the Iraq war, support for a timeline to redeploy U.S. troops and focus on terrorists who attacked New York and the Pentagon on Sept. 11, 2001; opposition to administration wiretapping, support for guaranteed health care and other issues. "[W]hile I've certainly enjoyed the repeated comments or buttons saying, 'Run Russ Run', or 'Russ in '08', I often felt that if a piece of Wisconsin Swiss cheese had taken the same positions I've taken, it would have elicited the same standing ovations," Feingold said. "This is because the hunger for progressive change we feel is obviously not about me but about the desire for a genuinely different Democratic Party that is ready to begin to reverse the 25 years of growing extremism we have endured." Joe Trippi, a Democratic strategist who ran the 2004 presidential campaign of Howard Dean, wrote in The Washington Post's Outlook section last week that Feingold was a Democrat to watch for the presidential nomination. "Perhaps the most authentic candidate, the senator from Wisconsin has a deep connection to the grass roots and is a favorite of the party's progressive wing. If President Bush stays stubborn on Iraq and the rest of the field plays it safe, Feingold could get very hot," Trippi wrote. Feingold, 53, is also noted for his support for campaign finance reform. He first ran for the Senate in 1992 and won re-election in 1998 and 2004. He had been publicly considering a run for the Democratic nomination for president since early last year. Former Virginia governor Mark Warner, who also had been weighing a bid for the Democratic nomination, said last month that he would not run. In an interview yesterday with the Milwaukee Journal Sentinel, Feingold noted that he would have faced long odds of winning the nomination. He told the newspaper: "It would have required the craziest combination of things in the history of American politics to make it work." With Russ' departure from presidential contention, the US public has missed a great opportunity. Reconsider the Move?? Naahhh . . . .
Any reconsideration about the move to Canada?? Not on your life . . . Our friend Daniel over at Would Be Canadians had an excellent post on this subject. We could not possibly have said it better. Be sure and read the article referred to by the link. It, too, is quite well done. Dixie Chicks - Sweet Revenge . . . .
Compliments of yesterday's Vancouver Sun, here's a review of the Dixie Chicks' sold out concert at GM Place here in Vancouver Wednesday night. Wish I could have been there, but at least I will get to see their documentary "Shut Up & Sing" while I'm here. Needless to say, it is playing in a very limited engagement back home in BushLand - one showing at a local film festival. Actually, I'm amazed that it's getting that much exposure . . . .
Dixie Chicks lead singer Natalie Maines drew cheers for saying its was a night to celebrate in the United States. The Dixie Chicks were feeling feisty Wednesday night. Playing to a sold-out crowd at GM Place the same day it was declared the Democrats had won a complete victory in the U.S. midterm elections, the high-energy trio was in a fast-fiddlin’, stiletto-stompin’, good-time kind of mood. Not that the politically outspoken trio is ever boring, but they really seemed to want to kick up some dirt Wednesday night and celebrate the day they’d been eagerly -- and publicly -- anticipating for nearly four years. After working the packed-to-the-rafters crowd into a frenzy with Goodbye Earl (a wickedly murderous tale about a woman who poisons the man who abuses her), frontwoman Natalie Maines lathered up fans by telling them they were the best yet on the band’s North American tour. Then she speculated why the crowd of 10,000 or so was in such good spirits. The audience, which had immediately fallen silent when Maines began to speak, screamed and hollered in agreement. Women could be seen all over the stadium wearing various home-made versions of anti-Bush T-shirts. And the largest response of the night was to the stubborn belt-it-out hit, Not Ready to Make Nice, which clearly references the band’s ongoing disagreement with Bush and his decision to invade Iraq. Of course, Maines, and band mates Emily Robison and Martie Maguire, have likely heard every George W. Bush joke or put-down out there since they ignited a fiery controversy back in 2003 when Maines told a British audience that the band was ashamed that Bush is from Texas -- their home state. The subsequent backlash included radio stations pulling Dixie Chicks songs from the airwaves, certain fans withdrawing their support of the band, and even the odd death threat. But the controversy also earned them new fans who were not only drawn to the music, but the band’s politics. It was hard to determine Wednesday night who was from the newer crop of supporters and who had been there since the beginning -- since the band was made popular by songs such as Wide Open Spaces, Sin Wagon and Ready to Run (all of which were played to the loud delight of the audience). Ready to Run was the final song of the band’s three-song encore and its fast-paced, rock ‘n’ roll sound had Maines proving that she doesn’t tire easily. In what appeared to be five-inch black heels, the small-framed singer beat her tambourine, turned her back to the audience and stomped and shook her way to the end of the song -- and the end of the two-hour show -- with a fervour she seemed delighted to finally release. Banjo plucker Robison and her fiddle-playing sister Martie Maguire were equally energetic and engaging throughout the concert, while the nine-piece band was perfectly tight in its support of the star performers. The band played their remarkably beautiful and melancholy version of Stevie Nicks’ Landslide, which had the mostly female audience putting arms around each other and swaying gently to the melody. But the love-in took a dramatic turn when the band launched into Not Ready to Make Nice. Women turned to each other and belted the lyrics into one another’s faces. The middle-aged woman next to me started aggressively punching an invisible someone or something in front of her. And it seemed as though nearly every single person in that audience had hollered that song out to themselves in the car or shower at some point because everyone seemed to know every word. There were a few quieter moments with Lullaby and Easy Silence -- two beautiful tracks from the band’s most recent album, Taking the Long Way. There were no dramatic special effects or visuals. There was no political backlash or violence during the show. The Dixie Chicks simply put on a really good not-too-country show that seemed to leave everyone happy (and even prompted one fan to hand Maines a single yellow rose of friendship as she was walking off stage). Ahhhh, revenge is sweet, eh, Chicks?? My first thought upon hearing of mr. bush firing "rummy" was: "He lied to us!" Glenn Greenwald (compliments of "Crooks and Liars") does an excellent job of detailing this event. When will the general public demand more of their elected "leaders"? We deserve better than this . . . . Heading in the Right Direction . . . .
Now here's some good news . . . .
Maybe the Tories should pay attention, eh? Time to Get Up . . . . So, after spending most of yesterday in transit from Florida to our future home in the West End I was tired last night. Three flights through Houston, Portland and then on to Vancouver had taken their toll. Can't complain much, though, as it was a Continental frequent flyer "freebie" . . . . So went to bed early - 9:00 pm local time, 11:00 pm our time in Florida . . . . Rolled over this morning and checked the bedside clock which read 5:36 am. Not bad, I thought, that's an hour longer than I would have slept if I were in Florida so I get up to greet the day. Flip on the TV and there's not much on this early . . . . Crank up the laptop and surf for about an hour . . . . It's still extremely dark out . . . . . Finally figure out that the bedside clock was still registering Daylight Time rather than the new and improved Standard Time. You got it: I got up at my regular rising time in Florida which just happened to be 4:36 am local time . . . . . .Arggggh!! Dual Citizenship Review . . . .
Looks like the Tories are going to review Canadian dual citizenship and it's rights/obligations. Why does this not give me a warm and fuzzy feeling??? Ottawa is reviewing the rules governing dual citizenship and whether Canadians living abroad should qualify for social programs when they return, Citizenship and Immigration Minister Monte Solberg confirmed Tuesday. The review comes in the aftermath of the mass evacuation of 15,000 Canadians from Lebanon last summer during the Israeli-Hezbollah conflict. Many of those Canadians hold dual citizenship and some have since returned to Lebanon. The move cost the government tens of millions of dollars. Speaking to a House committee on immigration, Solberg said it raised questions about the rights of citizens who hold dual citizenship and don't live in the country. "If we're in a situation where somebody's absent, isn't paying taxes but is going to be using our social programs down the road, I think Canadians would feel that that is unfair," Solberg said. He said the response from Canadians after the Lebanon evacuation is that citizenship conveys both benefits and obligations. "Canadians want to know that citizenship means something, that we are not just a port in the storm," he said. An estimated 90 countries now permit dual citizenship, including the United States and most of Europe. Canada changed its laws 30 years ago to allow Canadians to hold passports from another country. Since then two parliamentary committees have recommended the practice be reviewed. "Canadians are concerned about the issue of dual citizenship which is why the government has a responsibility to review the current system," Solberg said. According to the latest figures from Statistics Canada, more than half a million Canadians are dual citizens. One Year Anniversary . . . .
We've all been there - checking periodically on our application status on e-CAS. As today is the one-year anniversary of CIC receiving our completed application, I thought it was appropriate to check in. Alas, the information revealed is unchanged. Damn!! On a more positive note, now that it has been one full year perhaps we will hear something - anything - soon. The endless waiting for any type of correspondence from CIC is frustrating. One wonders how many applications are in the queue ahead of ours . . . . Ten, one hundred, thousands? 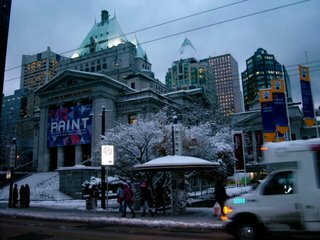 Another more positive note is that tomorrow I leave for three weeks in Vancouver. 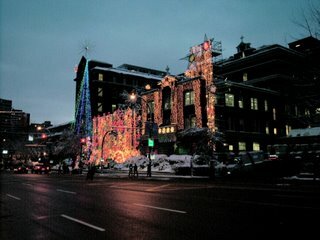 Yeah, I know it's not the best time of the year to go north, but just being in our future home enjoying the city and our friends there will be great. Unfortunately, "drf" is remaining in Florida with the Baby JoJo - I'm sure she will enjoy being with her Daddy rather than her buds at the Doggy Day Spa. 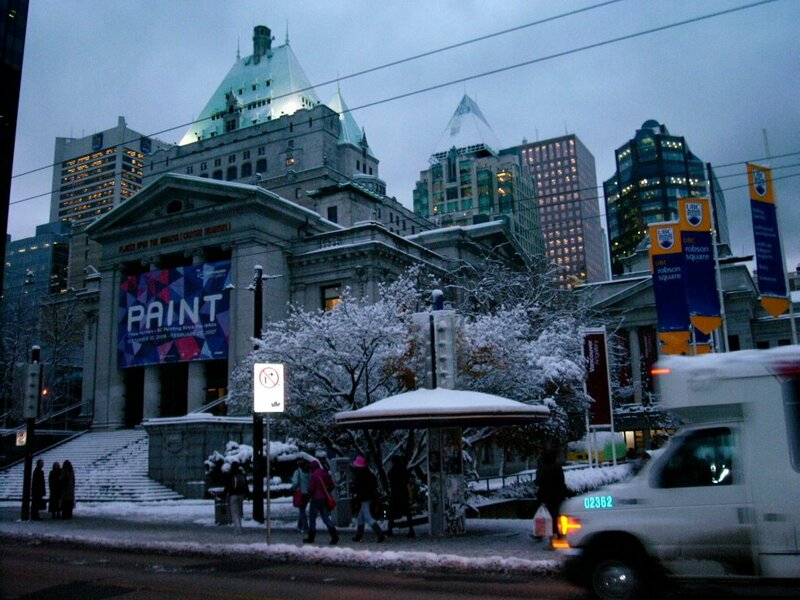 So, the next few posts will be originating from The West End of Vancouver . . . . I like the sound of that! Oh yeah, today is also the election in the US - Let's hope a lot of the rascals are thrown out! repuglican challenge on Nov. 7th . . . .
First there was this, and then this . . . .
Perhaps rather than a "Get Out the Vote" project on Tuesday the Republican National Committee should "Get Out the Lube and Condoms" instead. Bet that would really energize the party "faithful", eh? 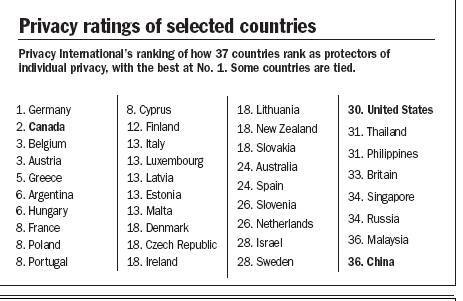 Another good reason to move north of the 49th Parallel . . . .
LONDON — Germany and Canada are the best defenders of privacy, and Malaysia and China the worst, an international rights group said in a report released Wednesday. Britain was rated as an endemic surveillance society, at No. 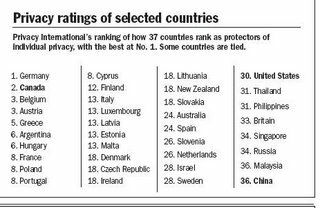 33, just above Russia and Singapore on a ranking of 37 countries’ privacy protections by London-based Privacy International. The United States did only slightly better, at No. 30, ranked between Israel and Thailand, with few safeguards and widespread surveillance, the group said. The study ranks countries on various privacy-related issues. These include whether they have a written constitution with specific mention of privacy, the use of identity cards and biometrics, electronic surveillance including closed-circuit TV cameras, interception of communication, access of lawenforcement agencies to private data, surveillance of travel and financial transactions, and global leadership in promoting privacy. On a scale of one to five, Canada scored three or higher in all categories. Canada received the highest ranking of five for its legal limits on the keeping of private data. It scored four in constitutional and statutory protection, privacy enforcement, ID cards and biometrics, leadership in promoting privacy and democratic safeguards. The watchdog organization tracks surveillance and privacy violations by governments and corporations, said director Simon Davies. It studied the reach of governments in their use of video surveillance in private locations, workplace monitoring and identity protection, among other areas. “The aim is not to humiliate the worst-ranking nations, but to demonstrate that it is possible to maintain a healthy respect for privacy within a secure and fully functional democracy,” said Davies. Efforts to quash terrorism have eroded individual privacy protections since the Sept. 11, 2001, attacks on the United States, human rights activists say. Governments around the world have imposed security and immigration legislation that invades people’s private lives, they say. In the U.S., President George W. Bush’s administration has come under fire for its warrantless domestic wiretapping program, which monitors international phone calls and e-mails to or from the United States involving people suspected by the government of having terrorist links. The New York Civil Liberties Union says there has been a staggering increase in surveillance of lawful activities with little concern for the civil liberties implications, said executive director Donna Lieberman. In 1998, the union conducted a survey of video surveillance in Manhattan and found more than 2,300 cameras in use. Last year, a similar study found more than four times that number in just 20 per cent of Manhattan, Lieberman said. S. Arutchelvan, a Malaysian activist based in Kuala Lumpur, said privacy has not been sufficiently protected since the government stepped up efforts over the past five years to track down suspected Islamic militants, dozens of whom have been detained without trial. “We believe there has been encroachment on privacy, such as the tapping of phones and other methods through telecommunications, in the name of fighting terrorism,” Arutchelvan said. Chinese legal activist Xu Zhiyong said strict Internet controls have resulted in fewer protections for Internet users in China. The Communist government has set up an extensive surveillance and filtering system to prevent Chinese people from accessing material considered obscene or politically subversive. Lawyers and academics raised awareness of privacy violations in China after a 2003 incident in which a couple was detained in the northwestern Shaanxi province for possession of pornographic videos. “In the past few years, authorities have been making some positive changes to respect the privacy of individuals,” Xu said.